Enjoy preferential rates every time you need a repair to your Mercedes in Newbury by choosing Pro-Tech as your leading local choice for a full range of professional automotive services. We always endeavour to bring our customers affordable independent prices that help save money on the cost of your annual motoring. 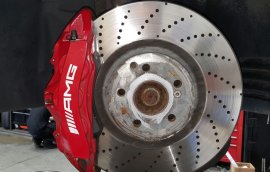 Trading as a widely renowned Mercedes specialist in Berkshire, our quality services are delivered by a professional team of skilled technicians and all of our services are administered without affecting your existing vehicle warranties. The passionate independent Mercedes specialist in Newbury. At Pro-Tech, we are every bit as passionate about Mercedes as you are and our expert team has the skills to work on the complete range of Mercedes models. From independent Mercedes car servicing in Newbury to diagnostics, MOT testing and components, Pro-Tech are your local one-stop independent Mercedes repair specialists. As long standing, five star members of the Good Garage Scheme we are regularily audited and every customer is requested to provide independent feedback which you can find in the green panel on the right. Don't take our word for how good we are.....read what our customers have to say! We provide guaranteed work, preferential pricing and a full range of additional benefits that have reinforced our reputation as an independent garage that always put the needs of our customers first. Visit us today to see why Pro-Tech are widely regarded as the first-choice independent Mercedes specialist in Berkshire and beyond. For independent Mercedes car servicing in Newbury, book your vehicle in today by calling Pro-Tech on (01635) 299811. We carry out Mechanical and Electrical repairs on all Mercedes models. Our technicians have vast experience in dealing with repairs from the smallest job to the most major. Whether your vehicle requires a simple check over, interim service, full service, major engine overhaul or a complicated engine management repair we have the tools and the experience to cater your needs. Regular investment in the latest diagnostics equipment including the Xentry Diagnostics System and full access to Mercedes WIS & DSB (Digital Service Book) and regular staff training ensures we can work on all the latest Mercedes vehicle systems and carry out repairs on all Mercedes models.